Turn inward for your voyage! The Lightning Path is a meta-physical, Earth-centered "temple of the imagination" within which are contained 20 subsidiary "temples-of-birth", each comprised of 13 numbers combined with 13 hieroglyphs. These combinations are abstract codes of transformation -- potent spiritual directives for anyone willing to spend the time and energy needed to translate them into form. Several years ago, my own work with these codes resulted in twenty "Invocations of Sovereignty". 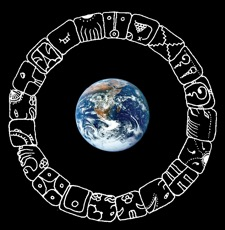 For example, the hieroglyphs and numbers shown to the left of each text line in the invocation below are what I worked from to craft the invocation for the Temple of Fingers and Toes. Links to my full series of twenty invocations follow this invocation.